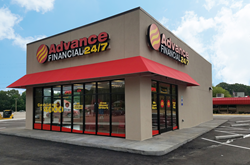 At Advance Financial, we are committed to serving more residents in Tennessee and across the country through both our innovative digital services and our brick-and-mortar locations. Leading fintech, Advance Financial, continued its expansion in West Tennessee with the opening of a store in Milan. The opening marks the 89th location for the company. The new location for Advance Financial, at 5070 S. First Street in Milan, is now open for business and will remain open 24/7 thereafter. Advance Financial is one of only a handful of companies in its industry that serves customers around the clock. For more information about Advance Financial, visit https://www.af247.com. Advance Financial is a leading fintech company based in Nashville, TN since 1996. Family owned and operated, the company is aggressively investing in the expansion of their market presence, completing 100 storefronts and a digital footprint in 20 states by the end of 2018. In keeping with its vision of a world-class customer experience, Advance Financial is delivering instant lending decisions and brick-and-mortar money services 24/7/365. Advance Financial maintains an A+ rating from the Better Business Bureau and was named to the Inc. 5000 list of the fastest-growing private companies in the country for the sixth year in a row. For more information visit https://www.af247.com.